In the ninth pAsuram, parAnguSa nAyaki‘s mother says “My daughter who is greatly attached to emperumAn, is considering the accusations thrown at her by the residents of the town as her companion and is going to thirukkOLUr”. Subsequently, parAnguSa nAyaki‘s mother says “My daughter who considers anything good she sees to be existing for krishNa, who is easily accessible to her, is ignoring the accusations of the residents of the town, and is going to thirukkOLUr”. ninaiththilaL – did not think about. My kind-hearted daughter, who is wearing thin ornaments, when seeing good objects which are known,thinks that they exist for krishNa; while all this material realm which is created for that is existing, she is now leaving me; the residents of the town are shouting loudly and accusing her, and she certainly walked to thirukkOLUr; she did not think about me in any manner. Implies that she neither thought her mother as a co-resident nor as one who lived with her as her mother. kAriyam nallanagaL avai kANil – She does not see anything to start with; but if she sees something good in objects, she will say that this is for krishNa who presented himself to me, and become melted and will remain like that. She says similar to whatever SrI rAma said in SrI rAmAyaNam sundhara kANdam 36.45 “dhrushtvA palam vA pushpam vA” (Whenever he sees fruits and flowers, he calls out for you – said hanuman to sIthA). She is seeking out something greater than just thinking that everything good she sees is for krishNa! His simplicity is the manner he descended to thirukkOLUr for her and remained there. idhellAm kidakka – [First explanation – giving up all these play tools] As said in SrI rAmAyaNam sundhara kANdam 16.19 “sarvAn bhOgAn parithyaya” (giving up all enjoyments). [Second explanation – giving up all the bhagavath anubhavam here] As said in thiruvaimozhi 6.7.1 “uNNum sORu parugu nIr thinnum veRRiai ellAm kaNNan“, thiruvAimozhi 6.7.2 “Urum nAdum ulagamum thannaip pOl avanudaiya pErum thArgaLumE pidhaRRak kaRpuvAn idaRi“, thiruvAimozhi 6.7.3 “pUvai paingiLigaL pandhu thUdhai pUmputtilgaL yAvaiyum thirumAl thirunAmangaLE kUviyezhum“. 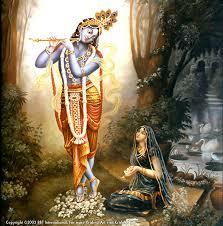 Giving up these unlimited wealth [kainkaryaSrI] here which exist for krishNa only. inip pOy – emperumAn will feel indebted to one who simply becomes fully faithful to him. For such emperumAn, she went to offer something and has her worries eliminated. He remains as said in yajur vEdham “thE bhUyishtAm” (We are reciting “nama:” which is too much to handle for you). Doesn’t it befit her to remain here if we look at his nature? sEri pal pazhi thUuyiraippa – As she got companion [accusations of the townspeople], she left there. Not just one or two! Also, each one says different accusations. pal pazhi thUuyiraippa – First she made herself exist for him; that was not sufficient; she left for going there; she did not consider her mother; she did not consider the accusations of the townspeople; emperumAn should have come to her seeing any of these – but he has not done anything. As said in thirukkuRaL 1141 “alarezhil Aruyir niRkum” (the accusations of townspeople will sustain her life). nErizhai nadandhAL – Her mother is also desiring to follow her daughter’s beautiful ornaments. nadandhAL – Though she is talking about her own daughter, once she took a few steps towards thirukkOLUr, her acts should be expressed only in a polite language [she could have said “pOnAL“, but is using more respectful term]. How respectfully she is treating her own daughter! Though own children or disciples, those who are immersed in bhagavath vishayam should be treated respectfully. Once nanjIyar greatly praised his disciple nampiLLai in an assembly and said “don’t think that I am praising my own disciple”! He mercifully continued to say – even previously there were those who said as in periya thirumozhi 8.2.9 “kaNapuram kai thozhum piLLaiyaip piLLai enRu eNNap peRuvarE” (a child who worships thirukkaNNapuram sourirAjap perumAL, even if it is one’s own child, it should be revered instead of being treated like a small child). ammuNi AzhwAn [an AchArya] would often offer obeisances to his disciple; when asked “what are you doing?”, he replied “we need to analyse the actions of other SrIvaishNavas to know about them! but I praise my Sishyas having known their vaishNava qualities very well”. emmai onRum ninaiththilaLE – Even if she did not take me along as a companion, should she not have at the least thought about me? onRum ninaiththilaLE – Should she not consider me as one amongst those who receive her there, or those who accompany her? The mother remains “Her thoughts about me are what I need”. The care of those who are close to emperumAn is that which is desirable/necessary. This entry was posted in thiruvAimozhi, thiruvAimozhi 6th centum on March 29, 2018 by Sarathy Thothathri.